Work within your design flow. In order to be effective, you want tools that work well together. Integration is an important aspect of the solution you are looking for. All of the dw-2000� modules are fully integrated throughout the application and can be accessed extensively through the GPE. This provides an unsurpassed level of inter-operability. 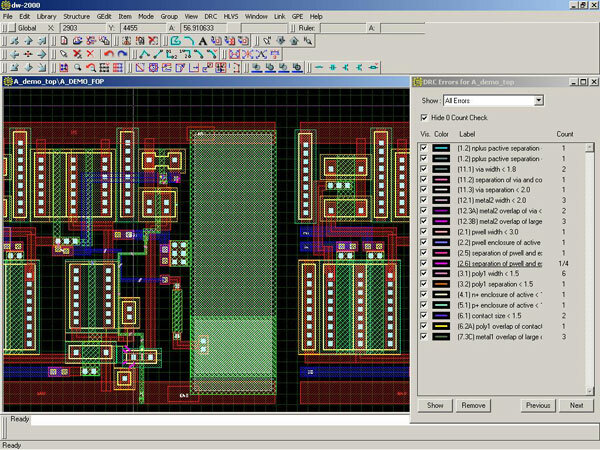 The HLVS module can extract circuit representations from the layout and highlight specific nets and devices in the layout. 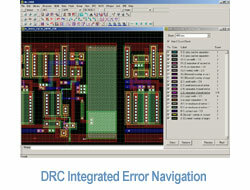 The DRC can be integrated with the Layout Editor for easy error navigation, including: legend dialog to facilitate error count, mask and navigation, color-coded error representation, and plain English error representation. For integration with other tools, you can use the Advanced GPE Extensions to exchange information through a C program. Whatever the design flow you use, we are convinced that dw-2000 can be adapted to fit nicely into it.